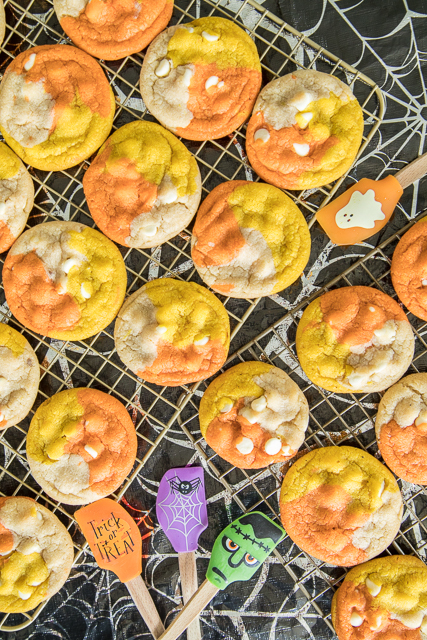 Fun, festive Halloween themed cookies. THE BEST chocolate chip cookie EVER! I ate WAY too many of these!! Shortening, bread flour, salt, sugar, brown sugar, eggs, vanilla, white chocolate chips, gel food coloring. Can make cookies with regular chocolate chips. 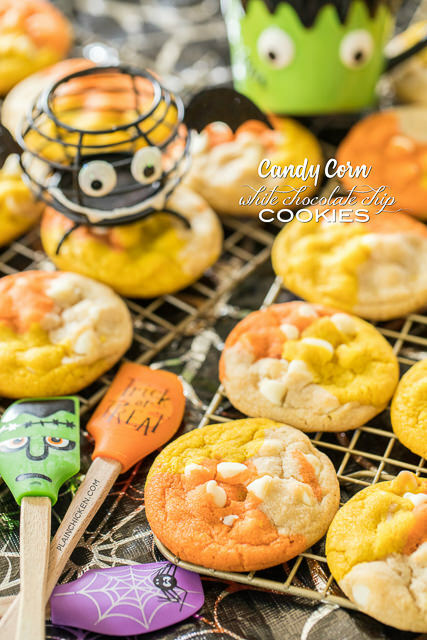 You can also skip the food coloring if you aren't making for halloween. Seriously THE BEST cookie recipe!!! It's finally time for all things Halloween! I know Hobby Lobby has had their Halloween stuff out since March, but we don't start Halloween on Plain Chicken until October. LOL! 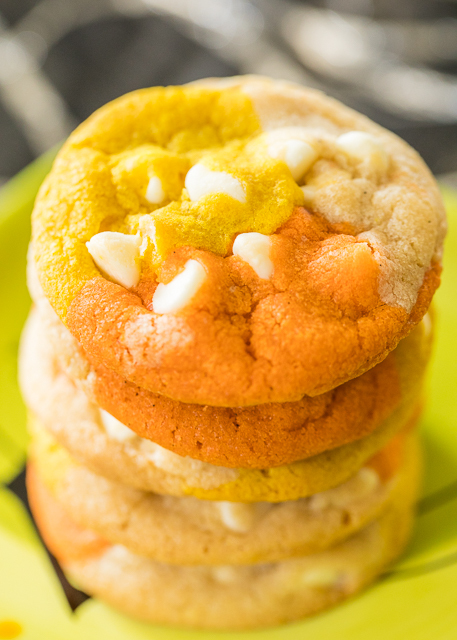 Today I am sharing these super cute Candy Corn White Chocolate Chip Cookies. Aren't they festive?!?!?! The best part is that the cookies themselves are ridiculously good. I mean really, really good. I had zero self control around these cookies. ZERO! I ate a ton of these cookies. I had to give most of them away to keep myself from eating them. 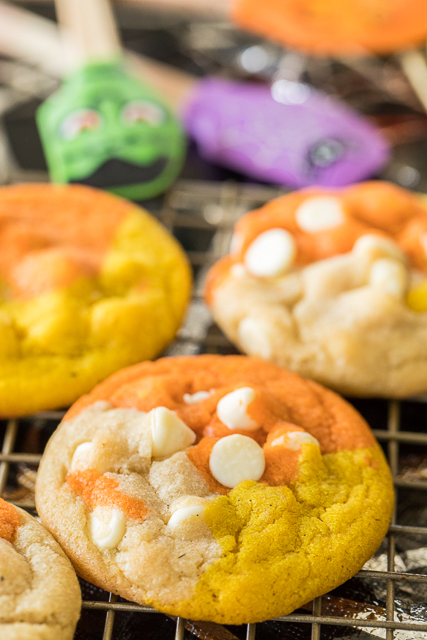 To make the festive candy corn colors, I divided the dough into three equal parts. I left one part plain, and dyed the other two parts orange and yellow with gel food coloring. I got the gel food colors at Hobby Lobby. They are back in the cake decorating section. They are about $2 per color. Just keep adding color until you get the desired vibrance. I dyed the dough and then stirred in the white chocolate chips. I didn't want the chips to get chunked up by the mixer while mixing in the food coloring. If you aren't a fan of white chocolate chips, you can use regular chocolate chips. I just used white chocolate chips to keep with the candy corn theme. You can also just make the cookies and not color the dough. The cookies are some of the best chocolate chip cookies I've ever eaten. You definitely need to make these ASAP! One more thing. This recipe uses shortening. I know I'm going to get tons of questions about this. NO, I have not made these with butter. If you choose to substitute butter for the shortening, it will totally change the texture of the cookie. I LOVED the cookie just the way it was. I wouldn't change it, but you can do anything you wish in your kitchen. Combine bread flour, baking soda and salt. Set aside. Add orange food coloring to one portion - mixing well. Stir in 2/3 cup white chocolate chips. Add yellow food coloring to remaining portion of dough, mixing well. Stir in 2/3 cup white chocolate chips. Do I get bread flour at regular grocery store? yes - it is right next to the all-purpose flour. All the major brands sell bread flour. Can I make the dough ahead of time, like a week. I want to make these closer to Halloween but working alot until then. Absolutely!! I suggest making the dough into balls and freezing it until you are ready to bake. Either thaw the dough or add a couple of minutes to the baking time. Thanks Steph, big relief, I wasn't sure because of bread flour. I did make them but ended up making them immediately, making more now and refrigerating till tomorrow, I think they will be fine, and BTW they came out great and were a big hit, that's why now I have to make more 2 days before Halloween. Thanks for such an easy and great recipe, and it is really easy.